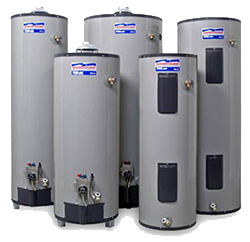 We are proud to sell and install American Water Heaters, an extensive line of residential and commercial water heaters available in a variety of storage tank sizes and models. These water heaters come with the Flame Guard safety system to help protect your family. Available in 30-50 gallon tank models, and featuring self-powered electronic gas valves, and high tech electronic gas control, the standard residential models will provide reliable hot water for years to come. And here’s a tip: when you first hear your old water heater burping and clunking, don’t wait for it to fail. (Having to take cold baths gets you in hot water with the rest of the family!) Give us a call and see what we can do for you. Thinking about warming up a cold room with a ventless wall heater? 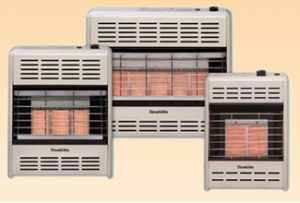 We sell and install HearthRite radiant gas heaters, exceptional value heaters that are 99.9% efficient, with pushbutton piezo ignition and standing pilot. These wall heaters work even when electric power fails, keeping your room warm and cozy. Whether your need is a smaller 10,000 Btu unit, or a large 25,000 Btu unit, we’ll help you find exactly what you need. Don’t let valuable work or living space go unused because it’s unheated. Let us install a HearthRite ventless wall heater for you. You’ll be glad we did.